Words to honor the watershed events of life--birth, coming of age, marriage and death. Inlcudes services for adoption, divorce and memorials. Index of authors, first lines and subjects. For ministers, hospices and more. 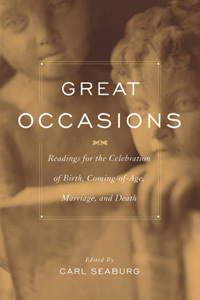 What are the great occasions in human life? Birth, maturity, marriage, and death: these are the four corners of human life. These are the crystallizing events, the distinguishable days, the great occasions. In these pages, Carl Seaburg has brought together over 650 pieces of writing to commemorate these moments. Poetry and prose, the work of writers as diverse as Aiken, Pound, Dickinson, Seneca, Blake, Buddha, Brontë, Marcuse, Stevens, Sexton, Tagore, Lippman, Sandburg, Sarton, Pasternak, Lao Tzu, Yevtushenko, and Yeats—the rich expression of human appreciation and celebration of our own great occasions. These then are the acts and words which proclaim it is good to exist, to know the pleasures and duties of maturity, to live companioned, and to experience life in its sorrow and joy. A Unitarian Universalist minister, Carl Seaburg served parishes in the three northern New England states and worked as an editor for Beacon Press, before his death in 1998. He was the author of Boston Observed and the co-author of Merchant Prince of Boston and Medford on the Mystic. Such music in a skin!